First things first – to use SSL FTP we need a certificate. The IBM manual says: Use following steps to configure the iSeries FTP server to use SSL. This document was created under the assumption that the user has already assessed Digital Certificate Manager (DCM) and has already either purchased a third-party certificate, or has created their own certificate to assign to the FTP server. Since this is a playground setup lets create our own certificate and have a little play. This will set the Allow secure sockets layer option to *YES. The *ONLY option will also allow SSL FTP connections; however, it will not allow regular non-secure connections to come through. After making the change, restart the FTP server (ENDTCPSVR *FTP and then STRTCPSVR *FTP). PS: IBM have you thought about updating this page so it doesn’t look like a Netscape throwback to the 1990’s? Click on the Select a Certificate Store button and choose the *SYSTEM store. Enter your store password when it prompts you (this was created by the individual who created the *SYSTEM store). Once you are signed in, choose the Fast Path > Work with server and client certificates. Preferably you will use an authorized certificate from an established CA (Certificate Authority) but we are going to cheat and use the ones that come with IBM i. 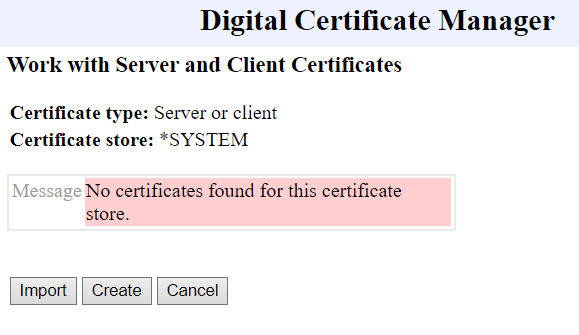 We will also stick in the *SYSTEM CERTIFICATE STORE for this example. SO, that she easy bit done. Check the box for IBM i TCP/IP FTP Server and click Continue. Click OK on the Application Status screen. And that.. as they say… is that. Now we just restart the FTP server application ENDTCPSVR *FTP and then STRTCPSVR *FTP. Check NETSTAT option 3 to verify the FTP secure port is listening. Anyone who wants to connect to the FTP server securely will need the CA (Certificate Authority) of the certificate that was used to secure the FTP server. You can export this CA and send it to whomever requires it. In DCM again, click on the Work with CA certificates option in Fast Path. Select the CA certificate you wish to export. If it was a locally signed certificate, you will see LOCAL_CERTIFICATE_AUTHORITY. Select the appropriate radio button and click the Export button below. Make sure the File radio button is selected and click Continue. Fill in the Export to File name: field. This file will go to the IFS, and you must include the path and name of the file you are creating. For example, to export to your personal home directory in the IFS, you could specify /home/myprofilename/cert.cer where myprofilename is your directory and cert.cer is whatever you want to call the certificate file. Note: Windows OS recognizes the .cer extension as a certificate and is probably a good choice to use. Send the file to who ever wants to use SSL FTP to connect to your box! They can import the CA to whatever application they use for client side FTP and connect to the FTP server securely.